Passover 2019: community seders around the Bay Area – J.
Passover begins at sundown on Friday, April 19 this year, and once again many local Chabad centers, JCCs, synagogues and other organizations are looking to foster warmth and community as they ladle out hearty bowls of matzah ball soup. From traditional seders to themed gatherings, here’s a selection of offerings that are open to the public. Reservations are required for just about every listing, and space is limited for many. Young kids are free at some of the seders, and some promise that “no one will be turned away for lack of funds.” Some have sign-up deadlines and/or offer discounts for early reservations, so what are you waiting for? “An Artistic Passover Seder”—Artists interpret portions of the Haggadah in a downtown Oakland loft. Hosted by JCC East Bay. Limited seating. At Oakstop, 274-14th St., Oakland. $18-$72. Chabad of Contra Costa—Community seder. At Chabad of Contra Costa, 1671 Newell Ave., Walnut Creek. 7:45 p.m. $30-$45. Chabad of Danville—Community seder. At Danville location given with RSVP. 7:30 p.m. $18-$36. Chabad of Oakland—Community seder. Space is limited. At Chabad of Oakland, 3014 Lakeshore Ave. 7:30 p.m. $40-$60, family discount. JCC East Bay community seder—For all ages. At JCC, 1414 Walnut St., Berkeley. 7:30-9:30 p.m. $18-$72. JCC East Bay family seder—Buffet-style meal and seder for families with kids ages 2-7. At JCC, 1414 Walnut St., Berkeley. 5-6:15 p.m. $18-$36. “Modern Exodus Seder”—Hosted by Kol Hadash Community for Humanistic Judaism. Meal is both catered and potluck. With music. At Albany Community Center, 1249 Marin Ave., Albany. 5:30 p.m. $15-$50. Tri-Valley Cultural Jews—Secular seder includes an English-language Haggadah readings and potluck dinner. At Bothwell Arts Center, 2466 Eighth St., Livermore. 5-7:30 p.m. $25. “Truth as Resistance”—A seder exploring how the concept of truth relates to Passover story and themes. Includes talk by social activist Rabi’a Keeble of egalitarian mosque Qal’bu Maryam (Miriam’s heart). Sephardic vegetarian meal and fragrance-free. At Kehilla Community Synagogue, 1300 Grand Ave., Piedmont. 4:30-9 p.m. $30-$68. Young Jewish Professionals—A seder with lots of English readings designed for (as the flyer puts it) “a young and fun crowd” and featuring “an overstocked selection of wine.” At Chabad of Oakland, 3014 Lakeshore Ave. 8:30 p.m. $25-$40. Urban Adamah—Vegetarian seder for 18-and-over in outdoor heated tent. Led by the educational farm’s founder, Adam Berman. At Urban Adamah, 1151 Sixth St., Berkeley. 6:30-9:30 p.m. $36-$180, sliding scale. “Passover at Green Gulch Farm”—Outdoor, morning seder for families with kids 7 and under with ecological group Makor Marin, followed by storytelling walk to Muir Beach. At Green Gulch Farm, 1601 Shoreline Highway, Muir Beach. 10:30 a.m.-1:30 p.m. Free, RSVP required. Rodef Sholom Sisterhood—Seder for sisters, daughters, mothers and grandmas. At Congregation Rodef Sholom, 170 N. San Pedro Road, San Rafael. 4 p.m. $36-$55. Chabad of Novato—Community seder in a renovated 1896 church building that now serves as city hall. At Novato City Hall, 901 Sherman Ave., Novato. 7:30 p.m. $12-$36. Chabad of Petaluma—Community seder. At Petaluma Women’s Club, 518 B St. 7:30 p.m. $18-$36. Chabad of Sonoma—Community seder. At Flamingo Resort Hotel, 2777 Fourth St., Santa Rosa. 7:30 p.m. $20-$40. Congregation Beth Ami—Fish, dairy and vegetarian dinner, plus accommodations for those with dietary restrictions. At Beth Ami, 4676 Mayette Ave., Santa Rosa. 6:30 p.m. $14-$30. B’nai Israel Jewish Center—Catered community seder and music by a trio that includes Jef Labes, former keyboardist for Van Morrison. At B’nai Israel, 740 Western Ave., Petaluma. 5:30 p.m. $18-$36. “Freedom and Love”—Congregation Ner Shalom community seder with various menus. At Ner Shalom, 85 La Plaza, Cotati. 6-9:30 p.m. $24-$48. Second-night musical seder—Featuring Rodef Sholom musicians and Cantor David Margules. At Congregation Rodef Sholom, 170 N. San Pedro Road, San Rafael. 5 p.m. $35-$65. Congregation Shomrei Torah—Annual second-night seder “honors our ongoing struggle for freedom, justice and equality.” At Shomrei Torah, 2600 Bennett Valley Road, Santa Rosa. 6:15 p.m. $23-$46. “Telling Our Own Exodus Story”—A women’s seder from a feminist perspective, with vocal music by Nightingale Trio. At Oshman Family JCC, 3921 Fabian Way, Palo Alto. 6-8 p.m. $15-$18. Women’s seder in Hebrew—Infusing the Passover story with women’s voices and experiences, with Avital Fighel on piano. At Oshman Family JCC, 3921 Fabian Way, Palo Alto. 8-10 p.m. $18-$20. 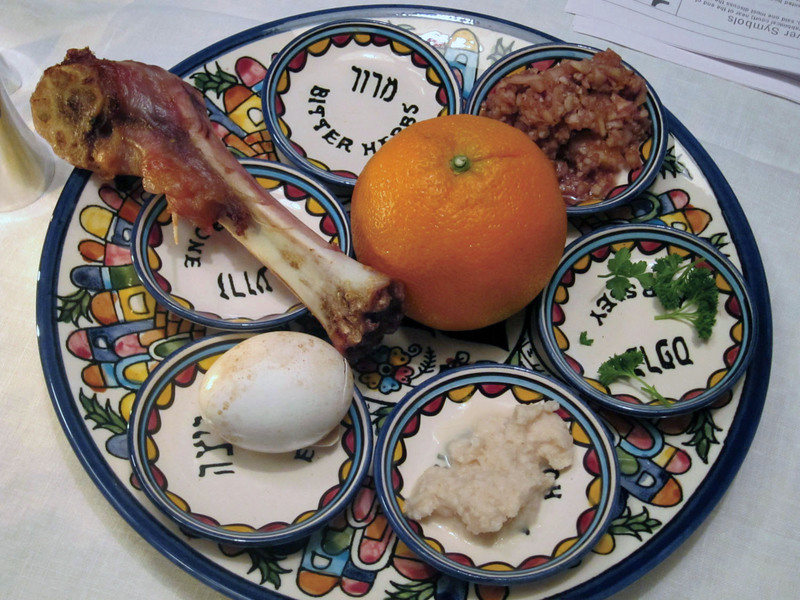 Chabad of Santa Clara—Community seder. Location given with RSVP. 7 p.m. $18-$54. Chabad of San Jose—Community seder. At Addison-Penzak JCC, 14855 Oka Road, Los Gatos. 7:30 p.m. $30-$45. Chabad of Sunnyvale—Community seder. Location given with RSVP. 8:30 p.m. $30-$40. Congregation Beth Jacob—A main seder, plus a “mini-seder” for ages 3-12. Veggie options by request. At Beth Jacob, 1550 Alameda de las Pulgas, Redwood City. 5:30-8:30 p.m. $10-$65. Peninsula JCC—A family seder that is billed as “playful, interactive and meaningful.” At Peninsula JCC, 800 Foster City Blvd., Foster City. 5-7 p.m. $10-$20. “Passover for Russian-Speaking Adults”—Part of OFJCC’s commitment to Russian programming, featuring a “What do you know about the Exodus?” quiz. At Oshman Family JCC, 3921 Fabian Way, Palo Alto. 6-9 p.m. $20-$30. “Social Justice Seder”—10th annual. This year’s theme is gender equality in the #MeToo era. Led by six rabbis, including USF Jewish studies rabbi-in-residence Camille Angel. Light Passover snacks, but no meal. At Fromm Hall, Maraschi Room, University of San Francisco. 6:30-8 p.m. Free. “S.F. Multicultural Freedom Seder”—23rd annual gathering features cross-cultural exchange, songs of freedom, storytelling, joyous camaraderie and a kosher meal. Co-sponsored by JCRC, JCCSF, Emanu-El and Sherith Israel. At JCCSF, 3200 California St. 5:45 p.m. $15-$40. Chabad of SF—Traditional seder with hand-baked matzah. At the SF Mint, 88 Fifth St. 7:30-11 p.m. $36-$72; $90 after April 11, RSVP required. Sha’ar Zahav “homemade” seder—14th annual. Bring a kosher-for-Passover side dish that can serve 6-8 people; the rest is taken care of. At Congregation Sha’ar Zahav, 290 Dolores St. 6-9 p.m. $20-$40. Congregation Ner Tamid—Dinner by Dina’s Kosher Katering. At Congregation Ner Tamid, 1250 Quintara St. 6:30 p.m. $65. RSVP at 415-661-3383. Emanu-El adult seder—For ages 11 and older looking for “discussion, singing and engagement” in a traditional setting. At Congregation Emanu-El, 2 Lake St. 6 p.m. $35-$65. Emanu-El young adult seder—For 20s and 30s, featuring music and a search for the afikomen. Limited space; members get priority. At Congregation Emanu-El, 2 Lake St. 6:30 p.m. $45-$65. Emanu-El family seder—Designed to engage families with children, it’ll be musical, participatory and fast-paced. No child care. Limited space; members get priority. At Congregation Emanu-El, 2 Lake St. 4:30-6:45 p.m. $25-$65. Sherith Israel second-night seder—Doubles as annual fundraiser for the congregation’s Chicken Soupers and HaMotzi programs that help feed the homeless. Music by organist and choir. Volunteer-prepared meal. At Congregation Sherith Israel, 2266 California St. 5-8 p.m. $20-$50. Vegan seder—100 percent vegan, plus a haggadah that shows how Passover themes intersect with veganism. With klezmer music and interactive programs. Hosted by Jewish Veg, Adam Swig and others. At Manny’s Café, 3092 16th St. 6:30-9 p.m. $48. Older adult seder lunch—Organizers say the low-cost lunch will include “a condensed but powerful seder” led by a rabbi. At JCCSF, 3200 California St. 11:30 a.m. $6-$12. Camp Tawonga Social Justice Seder—For 21-and-up alumni and friends of alumni. At Wise Sons Jewish Deli, 3150 24th St. 6-9 p.m. $36.